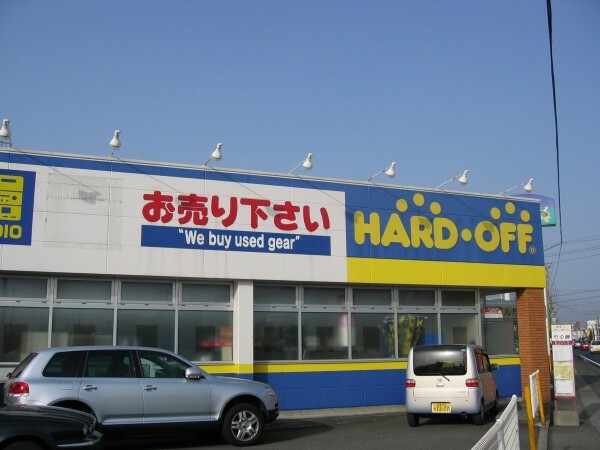 Today I went to a used electronics store called “Hard Off“. Yes, the name makes me giggle. The “hard” in “Hard Off” refers to electronics hardware. They sell used computers, game systems, TVs, stereos, and other electronics. They also have a good selection of software as well; CDs, video games, and movies. Fortunately someone in the marketing department realized that “Soft Off” or “Hard and Soft Off” would have sounded ridiculous. Hard off is about a 15-20 minute walk from Ooka City Plaza. I must have spent about two hours in the store, partly for shopping, partly for checking out all of the electronics that were never readily available in Canada. I resisted the urge to buy myself a WonderSwan, a classic Famicom (NES), or a laser disc player. I did end up getting a small wireless internet hub and a receiver. The wireless hub attaches to the router in our apartment, and broadcasts a wifi signal. The receiver connects to my computer with a network cable. I can now connect to the internet from my room without running wires down the hallway. Unfortunately the layout of my room is a bit awkward and I don’t have a desk, so the computer setup is not ideal at the moment. However, I am just happy to be back online without having to go to internet cafes anymore. If you are living in Japan temporarily, check out Hard Off. It’s a much better alternative than buying new stuff that you are just going to have to get rid of when you return home. This entry was posted on November 9, 2014, 8:00 pm and is filed under Life in Japan, Shizuoka. You can follow any responses to this entry through RSS 2.0. You can leave a response, or trackback from your own site.